Click Here READ THIS..THE KIND OF ADVERTISING MONEY CAN'T BUY. SSplit-Ring Pryers - Now "PATENTED". 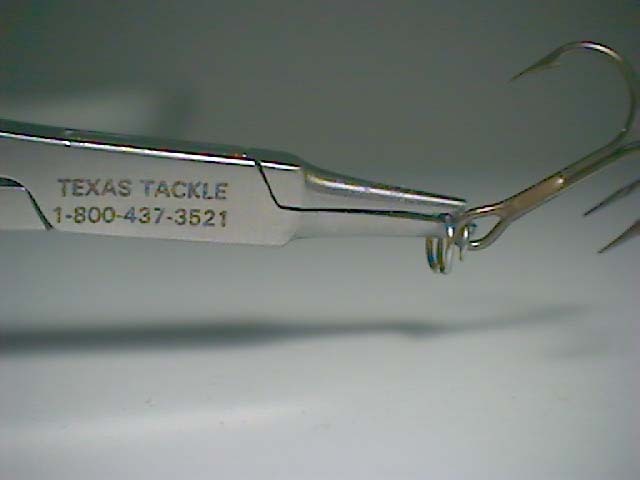 These are the split ring pliers that Salt Water Sportsman Magazine called the "World's Best Split-Ring Pliers" and have been written up in BASSMASTER, IN-FISHERMAN, WALLEYE IN-SIDER, THE FISHERMAN, SALTWATER SPORTSMAN, SPORTFISHING, FLORIDA SPORTSMAN, SPORTS AFIELD, and many other magazines and books. It's a new design that's the easiest to use and WORKS like it is supposed to!! They are made of high quality surgical stainless steel for corrosion resistance and dependable long life. Price is $17.99, plus $3.00 S&H. Use any credit card. Click on reports at Cabela's below and read the reports. You can order direct from us but first ask your dealer for them. Also available at Amazon(click here), Cabela's(click here), Tackle Warehouse, Hagen's, BassTackleDepot, BassDozer. DEALERS...call BIG ROCK, PITMAN CREEK, LAKELAND, HAGEN'S, ROSCO, FOLSOM, LEE LURES. In Canada Romppai’s wholesale(click here) (dealers only) , call them for their dealers. DEMO VIDEO #1 a demo video showing how to use the pliers. DEMO VIDEO #2 another demo video showing how to use the pliers. You'll need one of the free media players for the demos. 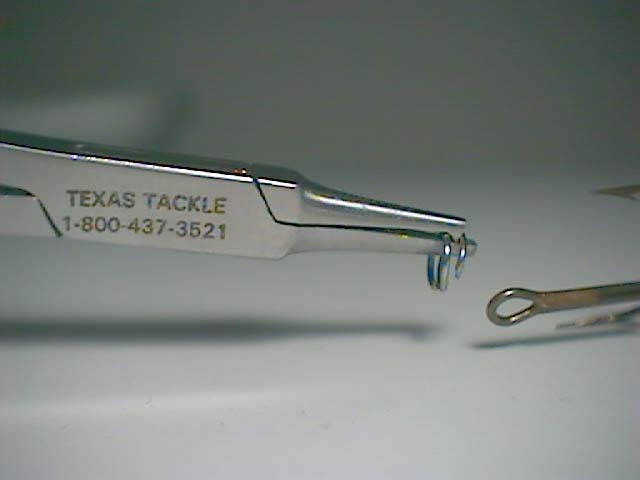 NEW, larger SSplit-Ring Pryers - These are the same patented design except they're made for the larger split rings found on pike, musky, peakcock bass, and offshore trolling lures. Price is $18.99, plus $3.00 S&H. To place an order or get more information, call, email, or fax us. Master Card, VISA, American Express and Discover credit cards are accepted. Texas residents add 8.25% sales tax.